As with most party planning, the menu is first and foremost. Making sure your guests are well fed and enjoy the tastes of the theme, it’s as important as the day itself! Traditional dishes include Corned Beef and Cabbage, Irish Soda Bread, and anything you can color with green food dye! Spruce up some favorite dishes like Irish Stew with cooked tomatoes, Shepherd’s Pie with bell peppers, and some cucumber slices in your Corn Beef and Cabbage Rolls, all compliments of Food Network. If traditional Irish dishes aren’t on your menu, we’ve got a great variety of green-themed recipes that will appeal to all taste buds this holiday! 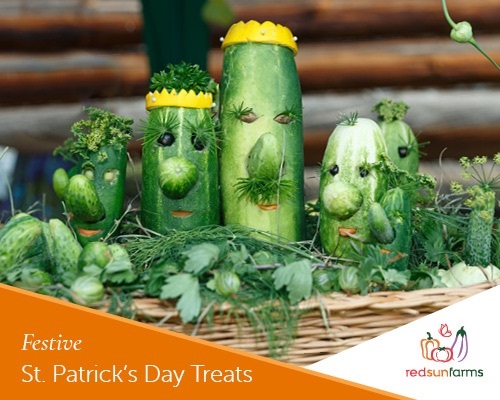 Check out our Go Green for St. Patty’s Day post for ideas! Don’t forget dessert! A delicious healthy option is a fruit tray arranged like a rainbow! Items like strawberries, orange slices, grapes, blueberries and banana make a colorful, edible rainbow (you can sweeten things up a bit by adding gold foil-wrapped chocolate at the end of the rainbow – chocolate coins or Hershey’s Rolo’s work great). Some other important areas of the party planning include décor, activities and attire. Think shamrocks, leprechauns and anything green! There’s also rumored to be a pot of gold at the end of a rainbow, so don’t forget a splash of color. Any local party store or a Google search online will offer a variety of decorations and attire to choose from, or try your hand at some DIY decorations from Good Housekeeping for your home or party. Some options to celebrate the day with festivities include attending a local parade, have your smaller guests make a craft, host a scavenger hunt or have a rainbow coin toss! Be sure to check out these fun games both kids and adults can enjoy from Play Party Plan. Wishing you the luck of the Irish in your planning, and a very happy St. Patty’s Day!